Much of the customization of choppers happens just because somebody said someone else couldn’t do something. 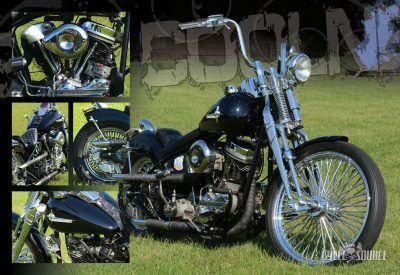 Just like throwing a long front end on a bike and have it ride and handle well, throwing a Knucklehead on your Panhead motor and having it run great. Both are exercises in nothing, but pure cool and both modifications serve no other purpose than to look dope and keep the keyboard commandos guessing. Basically, that’s the whole idea, to do to your ride what will simply blow everybody else’s minds. Not to go faster or make the machine operate with more efficiency but to just build something mind-bending for the sake of bending minds. It’s called custom, and anything else is a restoration. Just like the massive chassis modifications needed to make your bike long, making an engine run with parts that were never designed to be used on it will take a good amount of care and mechanical expertise. Even with the everything’s possible technology of today sometimes you just need someone who has done something to guide your path. That’s exactly what happened here. B.K. Keenan was traveling down this very path when he decided to do what he did to the 1950 Panhead you see in front of you. 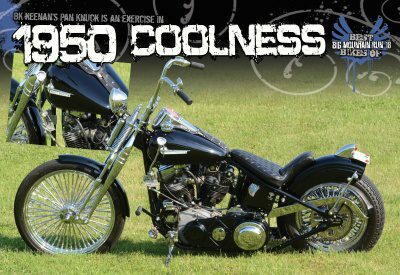 What started as an old chop from the late sixties had been restored 15 years ago and rebuilt into this incarnation a few years back. 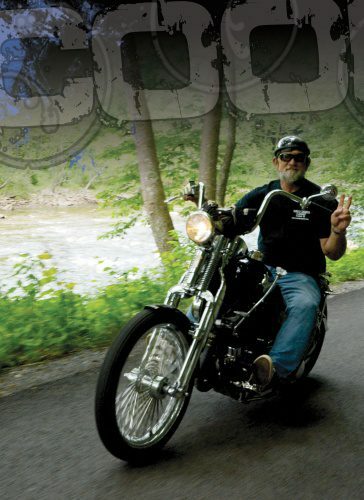 When B.K., who has been riding for 46 years and has had his own shop for 15 years, decided it was time for a revamp, he recalled those Pan/Knuckle motors from some David Mann posters but at the time didn’t even know where to start. A short while later he was handed a card from Steve McPhillips of MAX-V in New York. On Steve’s card was a picture of one of those very motors. B.K. had an in. The bottom end was then built by Steven. The started with a complete motor and tore it apart. The right size case is a stock 1950, and the left side case is a Delcron case with the bigger bearings. A pair of lightly stroked S&S flywheels were used and were modified along with the cases to accept the Knuck rear cylinder and head. The Pan can no longer be a Pan anymore as this modification changes the old passageways, lifters and lifter blocks. It will now only work with the rear Knucklehead and cylinder. The stock oil pump has now been replaced with a much more efficient S&S unit. B.K. has stated that the 83” runs and starts it’s best with a Super “B” replacing the Linkert and fired by a Morris Magneto. B.K. insists after one primer kick it starts on the first hot kick. Keep the doors open he also builds one entire bike for himself every year; this is one of them. The rest of the bike was assembled at B.K.’s shop All American Co. located in New Ellenton South Carolina on the Savannah River by Augusta Georgia. His shop puts out a build for itself once a year. Some besides the work he needs to do to keep the doors open he also builds one entire bike for himself every year, this is one of them. The bike runs a Santee hardtail frame based on a 32-degree rake. The front end is a newer springer off a 1995 Heritage. The little stroker motor is connected to a stock four-speed with Andrews gears via a 1” BDL belt and diaphragm clutch plates inside of stock tin inner and outer primary. Shifting chores are taken care of by an ungated police speed shifter located next to the OEM Harley 5.5-gal Shovelhead tanks. Speaking of sheet metal, the rear fender is a modified FL rear with a nice wire bead around the outside for strength. A stock oil tank was used as the bike runs without a battery. B.K. would like to point out that his grandson, Dalton Galloway who was 15 years old at the time is responsible for the paint and bodywork (that’s right…15). The seat was made in-house starting with a street sign, and an aftermarket dash was used temporarily. Everything was sanded and sprayed with a rich, deep coat of black paint. B.K. wanted to have the look of a brakeless front wheel but wanted a hill holder, so he made the bracket for the dual GMA calipers one that is foot operated and the other by hand. The bike has seen use for the last 3 years and hasn’t had any work done to its Pan/Knuckle configuration beside the improvements he has made along the way. B.K. would like to send out a couple of ‘thank yous’ to Bear and Steve from Max-V for all the help making his vision come true and his grandson Dalton for his help with the bodywork. This entry was posted in Feature Bikes and tagged 1950's Coolness, Back Issue, custom bikes, Cycle Source, Cycle Source Magazine, Feature bike, Harley, Harley-Davidson, Knucklehead, Panhead, September 2018. Bookmark the permalink.